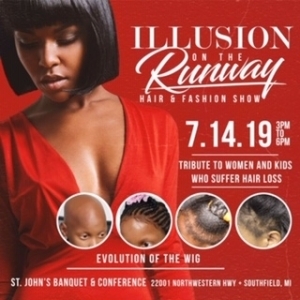 Illusion on the Runway Fashion & Hair Show will be held on Sunday, July 14, 2019 and is a tribute to women and children who have experienced hair loss. A variety of vendors will be on hand to share their fashion and hair product lines. The event will be held at St. John Banquet & Conference Center (22001 Northwestern Hwy, Southfield, MI 48075) from 3:00 - 6:00 pm. Tickets are available; contact 586-772-6656 for more information. Early bird pricing is $35.00 or $40.00 at the door. Cosmetology students receive admission at $30.00 per person. A strolling buffet dinner will be provided.